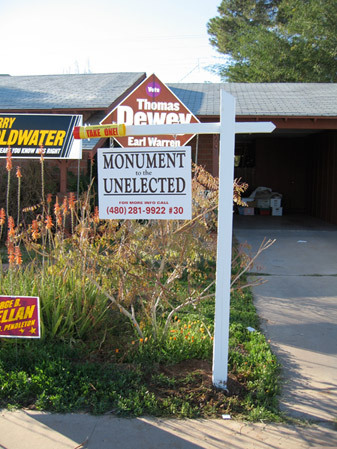 Monument to the Unelected was commissioned by the Scottsdale Museum of Contemporary Art for their 10th anniversary exhibition entitled Seriously Funny. 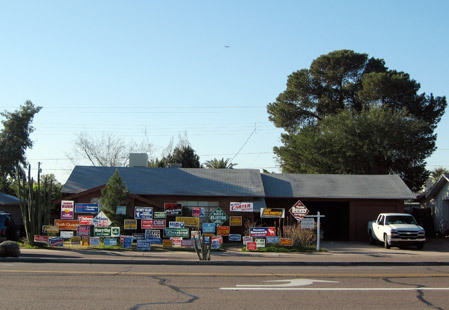 On my site visit to Scottsdale/Phoenix, which occurred a few weeks before the 2008 presidential election, I became fixated on the election signs that sprouted on front lawns, in vacant lots, or at busy intersections. 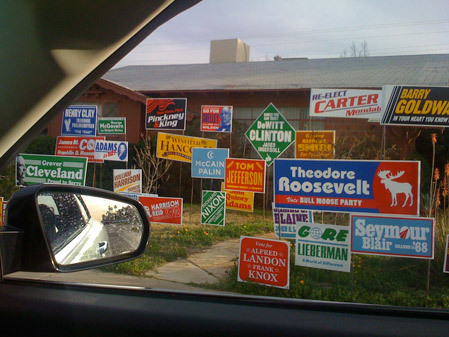 These markers tend to crop up only during a limited time window before an election. 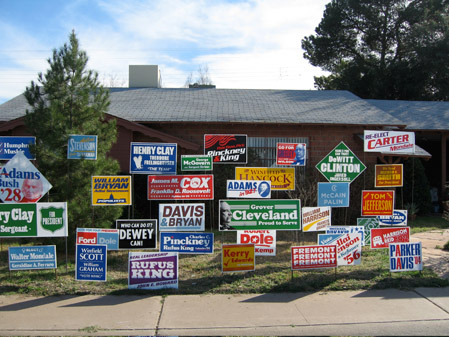 Once the elections are over, some of those names fade into obscurity whereas others become inscribed in history. 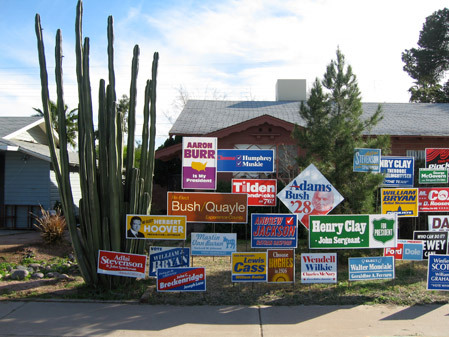 Working from this observation, I made a series of 56 signs advertising the presidential campaigns of every person who ever ran for president, and lost. 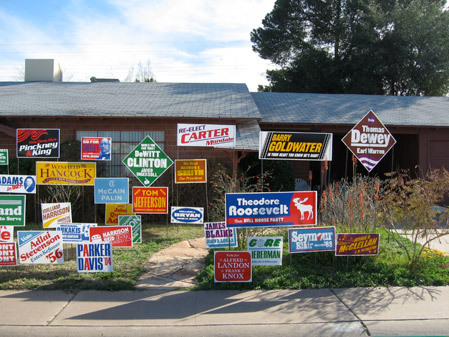 Each sign was made in a design vernacular that could have come from any time in the past few decades, even if it advertised a candidate from a previous century. 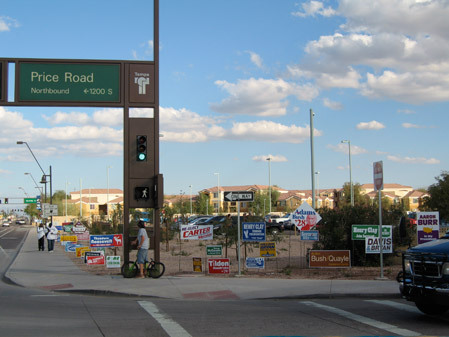 At a time when the country was preoccupied with the "fork in the road" moment of a major national election, the piece presented a view of the country's collective political road not taken. 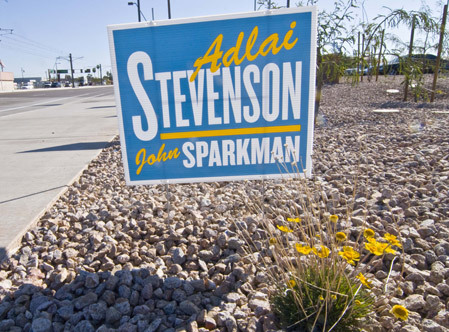 The piece was located on three different sites where signs like this are typically found: a front lawn in a residential part of Scottsdale, a vacant lot in downtown Phoenix, and a corner bordering a commuter parking lot just off a freeway off ramp in Phoenix. Special thanks to Cassandra Coblenz, curator, and Evan Gaffney, graphic designer, for their help with this project. To hear a short description of the piece by the artist, click here. Scroll down for image details.